I've gotten a lot of questions about my hair color and it's certainly been through a lot since my wedding so of course I wanted to share. First of all, I just wanted to give a little background on my locks. 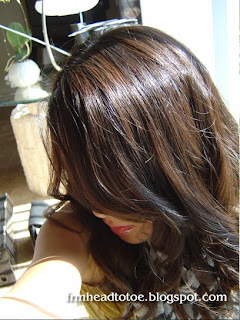 In the last few years I have had a "magic straight perm," a "setting perm," reddish highlights (that barely showed), drugstore haircolor highlights, and a few different cuts ranging from armpit-length to lower back. My hair is medium coarseness and it is pretty thick. I'm actually pretty low maintenance when it comes to my hair so I don't frequently get it cut. I just get a style and let it grow out then change the style each time I go in. I also don't ever radically change the color. If you look closely, you can kind see the St. Louis arch behind me there. This was two weeks before our wedding and as you can see, my hair is a light black color. It is actually browner toward the edges, but I would still call it "black" as opposed to "dark brown." My aunt (and hairstylist for the wedding) thought my updo would stand out more if my hair were lightened a bit and so we decided upon this color. It is a Korean brand called 꽃을든 남자 (translation: man who holds the flower) Clinic Color in the shade N7. It is the henna type from the brand and it was applied in an all-over highlight technique using foil. I was afraid it would be too light, but it came out just how I wanted it to be. Very natural but with a noticeable difference. My aunt also discouraged me from cutting my hair before the wedding so she could have all the volume she could get from the styling. It got to be pretty long and shapeless. This is curled and natural, before I cut it. Finally, I got a proper cut which was lovely because all of the damaged parts were taken off as well as much of the weight. I wanted something edgier than before which I couldn't do before the wedding. The back is still pretty long, but with tons of layers and choppy bangs! I will get more and better pics of it soon, but I have to say, I LOVE it. Hair horror stories - where do I begin? There was the time I dyed my hair black using store bought box color... Then my parents demanded I get the black out and back to a normal color. Not knowing how, I bought a "color stripping kit" which only ended bleaching my roots a copper red. In disgust and frustration, I then re-dyed my hair black. That's when I was sent to a salon for 4 hours, 2 bleachings, 1 all over brown and 1 highlights which left my hair FRIED and I had to cut it all off. Then I tried the "wand" store highlights which were actually bleach on a stick and because I can't be trusted to take the time to use a wand, I tried to do it with my fingers - leaving me with leopard like bleach spots. Another trip, in tears, to the salon, more dye, and I cut bangs to help "disguise" it and we were back in business. There was also the time I asked for chunky "red and blonde" highlights and ended up looking like a mixture of carrot orange and straw yellow. That was horrible too. Not a horror story, but a random comment: With pretty course thick Asian hair (also cut short), I have to say that the only hair brand I have found to work as stated on the bottle is bumble and bumble. Would highly suggest the 'grooming cream' and 'hair powder'. Great way to achieve textured smooth locks or crazy matte volume respectively. Bit expensive, but definitely worth it! miemiemie: If you really want it, you should try it. Maybe try black lowlights so it looks more natural when it grows out. But I do think it is a blessing to have naturally brown hair as an Asian. It's fun to be different! Other than cutting it, try deep conditioning it once a week with a hair mask, or hot oil treatments. I think I'm going to try hot oil soon so I'll let you know, ok? I like your new hairstyle, it's fresh and youthful. The subtle color in your hair's also really nice, it looks VERY healthy!! sylvia: Try to find a good, dense, fluffy brush for blending. It really makes a big difference when you are trying to make a smooth gradient. Just keep experimenting!